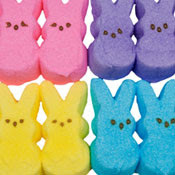 Budget Barbie: What to do with leftover Peeps! What to do with leftover Peeps! Those sugary, marshmallowy, cute little critters that show up in the store aisles this time of year hoping to make their way into Easter baskets. Peeps! Adorable to look at, fun to play with a yummy to eat... but many times kids and parents alike get their fill of them while there are still many left. What to do with leftover Peeps!? Here's my pretty pastel and delicious idea; Make Rice Krispie Bars with them! Use marshmallow Peeps in place of all or part of the marshmallows called for in your recipe. The flavor is delicious and the pastel color adds a pretty touch to everyday cereal bars. Melt the butter and marshmallows together in the microwave or in a pan on the stove top. Add the cereal, stir quickly and press into a buttered pan with buttered hands to keep the cereal from sticking to you. If you can wait long enough, let them cool. If you can't wait, the ooey gooey squares are delicious warm even if they don't hold their shape!